I'm sure you have seen those No Shirt, No shoes, No Service signs. But have you ever seen any barefoot-friendly sign like No Shirt, No Shoes, No Problem? Yes, they do exist in certain barefoot-friendly places. The following took place a few years ago when I was 12 years old. We were going on a mini family vacation to the island of Kauai one winter right before Christmas and spend a few days at a resort. Our older siblings (Steve who was in college, and Debbie who was in high school) weren't coming along as they wanted to spend time with their friends. So it would be 5 of us: dad, mom, my little sister Sharleen (nicknamed Lynn), little brother Kevin, and myself. Steve drove us to the airport in the morning. When we arrived Sharleen gave him a kiss to thank him for taking us there. "Oooh, thank you! It's not very often I get kissed by a pretty girl," teased Steve. The cute 9 year old blushed a little, and we all laughed. At the resort Sharleen and I shared a bedroom just like at home, and Kevin got to sleep with mom and dad. Kauai is a very barefoot friendly place. We saw a number of barefoot people just about everywhere we went, including in Wal Mart which on the mainland is quite notorious for giving barefoot customers a hard time. One day we were strolling along a shopping strip by the beach when we saw a restaurant that had gotten quite good reviews online, so we decided to have lunch there. 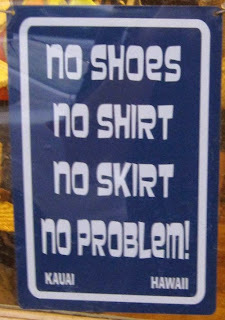 But we were taken aback by the "shirt and shoes required" sign they had on the door. Those signs are common on the mainland, but not here on the islands. We were about to move on and find another restaurant when a lady came out and said, "Aloha! Would you like to come in?" "Oh, we would love to, but our 2 girls here don't have shoes on," said dad. Then the lady said very softly, almost whispering, "That's OK, just come in. The sign is meant more for tourists who sometimes walk from the beach across the street in only their swimsuits. That's what we don't want. You guys look like locals, and I know some locals like to go barefoot. So come on in." Sharleen and I looked at each other and smiled. "Magic!" she said, and I nodded. You've got to believe in magic to experience it in your life on a regular basis. There is nothing too mystical about it, though. You just have to think good thoughts and have a positive attitude at all times or at least most of the time, and you will manifest wonderful things in your life. Sharleen and I had fun playing this game even when we were kids. Whenever we faced uncertainty, we would think good thoughts, and only good thoughts about the situation, and the outcome was always in our favor. A good example of this is when she went barefoot at school and got confronted by a teacher. The magic is even more powerful when both of us join forces. But I digress. 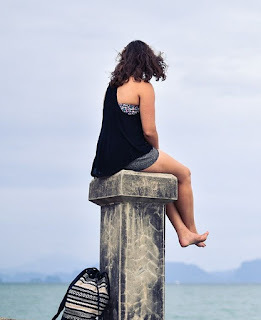 Once we were seated our bare feet were invisible to most other people. Our server was very friendly, and the food was delicious. So it was quite a nice experience. Later that evening we were in the town of Kapaa. Again we were strolling when we came cross a store with a very interesting sign on the glass window (see picture). Quite the opposite of what we saw earlier at the restaurant. 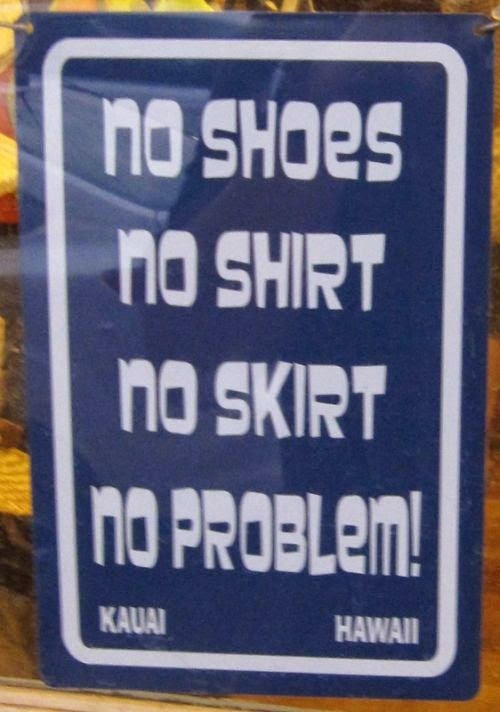 The sign has a humorous tone with the added word "skirt", but it reflects the laid-back attitude of the store and people on the island in general. I believe the name of the store was Hee Fat. So, go visit it whenever you are on Kauai. Note: the picture was taken a few years ago, so the sign or even the store may or may not still be there today. People on the mainland could learn a thing or two from the Hawaiians and just "hang loose," and this world would be a better place. The next morning was cloudy and drizzly. Mom made breakfast for us at the resort so we didn't have to go out. But we decided to go sight seeing after breakfast. Mom asked Lynn and me, "Will you girls be OK walking barefoot out in the rain?" What? Would we be we OK? We would LOVE it, hehe! "Of course, mom. We'll just have wet feet. Just like when we go to the beach or swimming pool our feet get wet. It's no big thing," replied Lynn. What a smart girl. "OK, point taken. But should you ever feel you need to wear sandals, please let us know, and we'll go buy them," said mom. 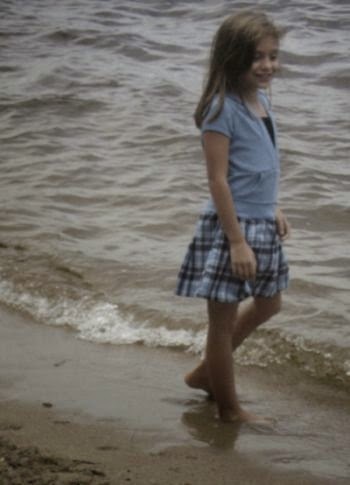 We had the time of our lives walking barefoot on wet surfaces that day. It was a bit cool, so we wore light jackets to keep our bodies warm. We stopped by the farmer's market to buy some fresh fruit, and our feet got pretty muddy which was delicious! But mom scolded us for walking in the mud, and made us wash our feet before entering our unit at the resort. Before we knew it, it was time to fly back home but we had a fantastic time there. It was a magical mini vacation, and Kauai is one of the most magical Hawaiian islands. And yes, no shirt, no shoes, no problem! Just hang loose and enjoy life. Steve picked us up at the airport, and we had a wonderful Christmas with the entire family. I had previously heard that Seattle was a barefoot friendly city, so I was excited when I had the chance to prove it for myself early last summer. My girlfriend Sandra and I were going a cruise to Alaska leaving from Seattle. As you know from one of my previous posts (barefoot thanksgiving break) I'm bi, and Sandra who was my childhood best friend, is lesbian. Anyway, we were planning to stay in Seattle for a day before the cruise, and we already booked a hotel. It was a quaint little waterfront hotel, and we were lucky to get an ocean view so that we could watch ships pass by. Sandra has relatives in Seattle whom she wanted to spend some time with, so she flew in a day earlier.